September brings a crisp freshness in the morning air and, with it, anticipation for the beginning of a new academic year. In the university environment, it also brings renewal and the excitement that goes with welcoming a new group of students to our schools. 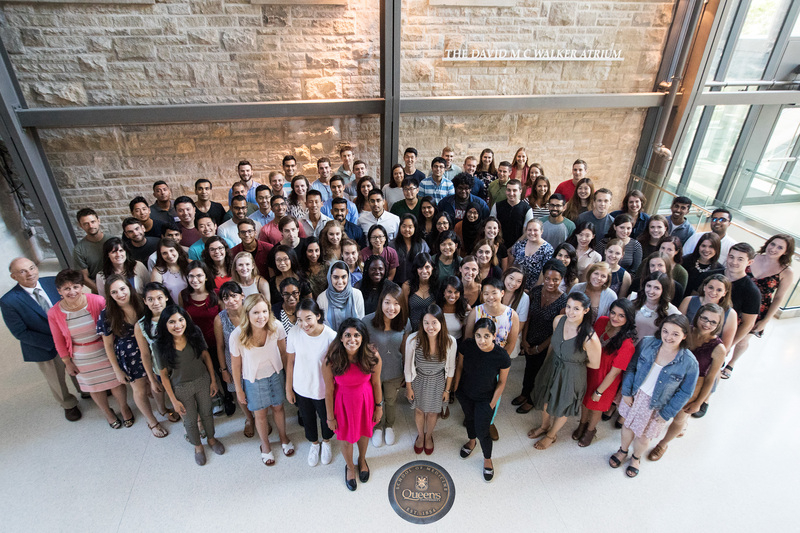 This week we welcome members of Meds 2020, the 162nd class to enter the study of Medicine at Queen’s since the school opened its doors in 1854. They were selected from a pool of 4518 highly qualified students who submitted applications last fall. Their average age is 24 with a range of 19 to 36 years. Women comprise sixty-two percent of the class, the largest proportion in the history of our school. An eclectic and academically very qualified group, to be sure. Last week, they undertook a variety of orientation activities organized by both faculty and their upper year colleagues. On their first day, they were called upon to demonstrate commitment to their studies, their profession and their future patients. They were assured that they will have a voice within our school and be treated with the same respect they are expected to provide each other, their faculty and all patients and volunteers they encounter through their medical school careers. At that first session, they were welcomed by Dean Reznick who challenged them to be restless in the pursuit of their goals and the betterment of our society. Mr. Jonathan Krett, Asesculapian Society President, welcomed them on behalf of their upper year colleagues, and Dr. Rene Allard provided them an introduction to fundamental concepts of medical professionalism. Over the course of the week, they met curricular leaders who will particularly involved in their first year, including Dr. Michelle Gibson (Year 1 Director) and Dr. Cherie Jones (Clinical Skills Director). They were also introduced to Dr. Renee Fitzpatrick (Director of Student Affairs) and our excellent learner support team, including Drs. Martin Ten Hove, Jason Franklin, Kelly Howse, Susan Haley, Josh Lakoff and Craig Goldie, who oriented them to the Learner Wellness, Career Counseling and Academic Support services that will be provided throughout their years with us. They met members of our superb administrative and educational support teams led by Jacqueline Findlay, Jennifer Saunders, Sheila Pinchin, Amanda Consack, Kate Slagle, and first year Curricular Coordinator Corinne Bochsma. Dr. Jaclyn Duffin led them in the annual Hippocratic Oath ceremony. Dr. Susan Moffatt organized and coordinated the very popular and much appreciated “Pearls of Wisdom” session, where fourth year students nominate and introduce faculty members who have been particularly impactful in their education, and invite them to pass on a few words of advice to the new students. This year, Drs. Bob Connelly, Jaclyn Duffin, Jay Engel, Melinda Fleming, Jason Franklin, David Holland, Steve Mann, Laura Milne, Heather Murray, Ashley Waddington, David Walker and were selected for this honour. On Friday, the practical aspects of curriculum, expectations of conduct and promotions were explained by Drs. Michelle Gibson and Richard Van Wylick. They were welcomed to our Anatomy Learning Centre and facilities by Drs. Steve Pang, Les MacKenzie, and facility manager Rick Hunt, and participated in the annual memorial service with a moving dedication by University Chaplin Kate Johnson. Their Meds 2019 upper year colleagues welcomed them with a number of formal and not-so-formal events. These include orientations to Queen’s and Kingston, introductions to the mentorship program, and a variety of evening social events which, judging by appearances the next morning, were much enjoyed. For all these arrangements, flawlessly coordinated, I’m very grateful to Rebecca Jozsa, our Admissions Officer, and second year Vice-President Diana Cuckovic. I invite you to join me in welcoming these new members of our school and medical community.